One of the apps that the iPad Pro has really unlocked for me has been Autodesk Graphic (previously iDraw), an incredibly powerful vector illustrating app on iOS. I picked Graphic up late last year while it was on sale, and I’ve been playing around with the app over the past few weeks. I’m pretty new to vectors, but I’ve used Pixelmator for a few years now, so the toolset isn’t completely foreign to me. 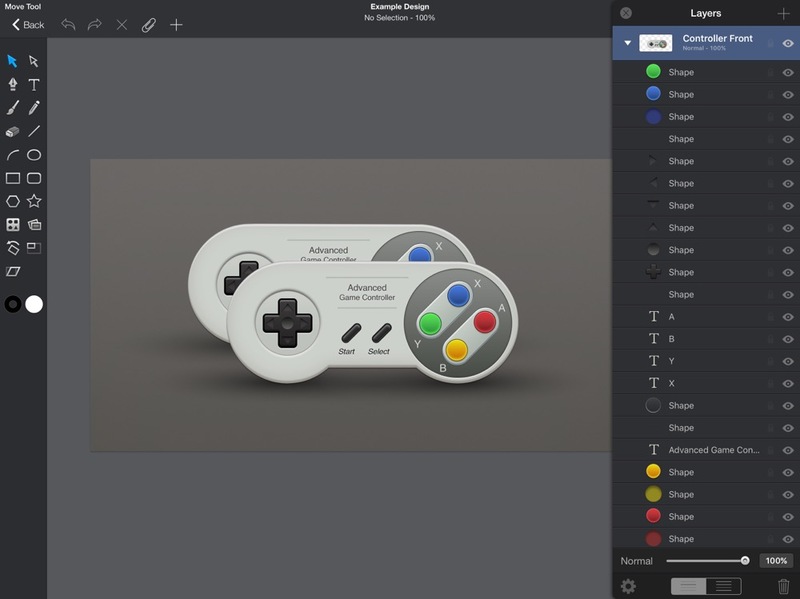 The left toolbar features move tools, brushes, pens, pencils, basic shape tools, and even shape libraries to insert specific pre-made objects onto the canvas. There’s also a great RGB colour picker, complete with hex values. I love Pixelmator on the iPad, but having used Graphic for a few weeks now, I think the Pixelmator team could have afforded to be a little more traditional (read: desktop-like) with its UI, especially on the iPad Pro. 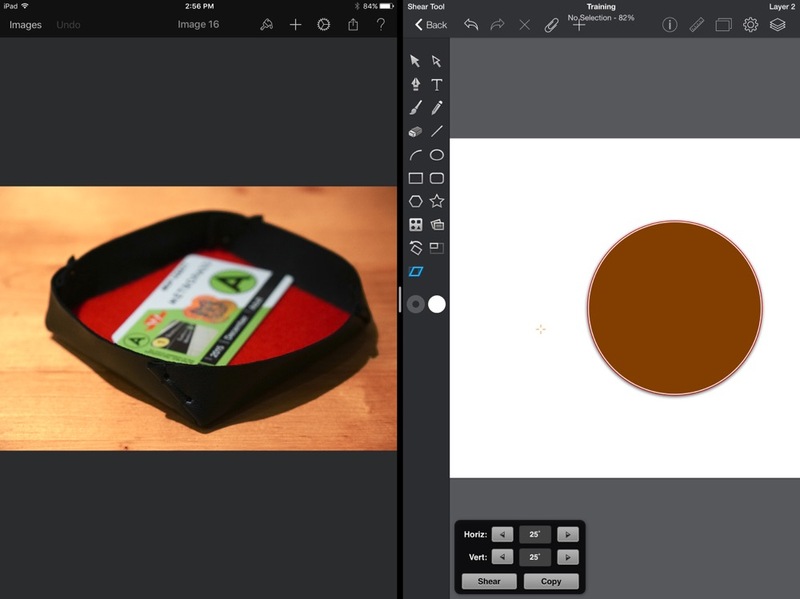 Getting started with the app can be intimidating, but Graphic does a great job of introducing you to the world of vector design. There are five help files built right in to the app from the get-go, and the official website has some incredible tutorials on their website. Not only do they offer step-by-step directions with annotated screenshots for specific exercises (ex. create an icon, draw a notebook, etc. ), but they actually have tutorials for all three versions of the app. Each version is similar, but it’s great to have a completely guided tutorial that’s tailored for the iPad version of the UI, as opposed to jury-rigging one meant for the Mac. My Apple Pencil is extremely accurate within Graphic, to the point where I can reliably pull the handles to adjust the strokes of the pen tool, just like I would on a desktop app. The app does a pretty good job of palm rejection 80% of the time, but there are still some annoying instances where my palm will be registered as a stroke. I quickly developed a workflow of drawing with my right hand and keeping my left near the toolbar, ready to select new tools or trigger the undo button. Left-handed users aren’t left out, though: there’s also an option to move the toolbar to the right side, if you’re so inclined. What I do miss in Graphic are keyboard shortcuts for quickly undoing changes, or de-deselecting a point. These are things I do often in Mac drawing apps. Quick two or three finger gesture controls are lacking, as well, so there’s a lot of low hanging fruit for Graphic in 2016. I’d love to see some dedicated keyboard shortcuts and quick gestures for undoing, deselecting, or bringing quick toolbars up. The iPad Pro’s screen is also large enough that you can afford to have the layers tab open at all times, so I’d love an option to lock it in place. However, these aren’t issues that stop me from enjoying Graphic. I love how the app can hold multiple files open in tabs for quick referencing, or how I can insert pictures inside of objects for quick tracing. Graphic is also a great iOS 9 citizen with Split View multitasking. Keeping the app open on half the screen is still surprisingly useful, given how easy it is to zoom in and out. What’s most surprising is Graphic’s price: at $9, it’s an absolute steal if you’re interested in doing vector design on your iPad (and I actually think it should be priced higher). If you’ve picked up an iPad Pro and Pencil, Graphic is definitely one of the apps that will make your hardware purchase worthwhile. Nice review. I may opt to try this one out next time I need a vector based design app.